Project development partners of the second LNG project for the country, Papua LNG, have signed a memorandum of understanding with the State for the completion of the Gas Agreement by the end of the first quarter of 2019. The signing took place on last Friday at the Total head office in Port Moresby along the lines of the APEC CEOs Summit opening day taking place as well. 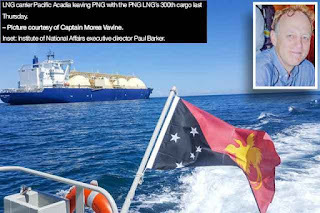 On hand to witness the signing was Prime Minister Peter O’Neill and Minister responsible for Petroleum Fabian Pok and other ministers. Papua LNG syndicate included Total Chairman and CEO Patrick Pouyanné, ExxonMobil Senior vice president Neil Chapman, and Oil Search managing director Peter Botten. “We are pleased to be here to witness the signing of a memorandum of understanding between Total and the project participants and the State on the way forward for the Papua LNG Project that is being developed in the Gulf and the Central provinces,’’ he said. “This is another historic moment for Papua New Guinea, this is the beginning of the development of our second LNG in our country. He said the MoU outlines the physical steps that will guide developing the agreement and commitments project participants and the state are make to each. Mr Pouyanné said the partners are committed to the project as they were committed to APEC itself last week. “Of course our objective is to be able to develop that project and the community and all the people around and we know it an important project after a successful PNG (LNG) project and I think this one will be easier,’’ he said. “We spent quite a bit to find how we could benefit together of the first project and now the second Papua LNG of course will be developed in the Gulf province on new resources with our two partners.